The foreigners' graveyard at Tamsui [淡水] (also written as Tansui, or Hobe) traces its origins back to the late 1860s, a time when the first foreign merchants were establishing themselves at the port, mainly to trade opium for camphor and tea. By the 1870s, the graveyard had officially taken the name of the Tamsui Foreign Cemetery and was being cared for by the newly-arrived Canadian Presbyterian Church under Dr George Leslie MacKay. In 1890 the British Consulate at Tamsui took control of the cemetery, assuming responsibility for its care and maintenance and also overseeing the burials. Apart from a hiatus from 1941 to 1946, the British supervision continued right up until 1972, when their Consulate was closed as part of the agreement which finally sent a British Ambassador to Beijing. Following the departure of the British diplomats, care of the cemetery was passed to the Australians. When the Australians followed the British in 1973, responsibility was handed over to the US Embassy. However, when the Americans in turn departed the island in 1978, the cemetery was left friendless and uncared for. The untended graves found a friend in Jack Geddes, a Canadian Presbyterian missionary. After initially caring for the cemetery with friends, in 1984 Geddes persuaded the newly-formed Canadian Society to take on the care and maintenance of the Tamsui Foreign Cemetery, and the society has been doing so ever since. In 1998, the Tamsui Foreign Cemetery was designated a National Historic Site Class C, ensuring its preservation. The Tamsui Foreign Cemetery, which is roughly the size of two tennis courts, is located on the hill above the Tamsui River in Hsin-min Street [新民街]. The plot (see Plan at the bottom of this page) is divided by paths into four sections: generally, Protestants were buried on the East; Catholics to the South; merchants to the West; and officers to the North. In January 1939, the British Consulate compiled a record of all the graves in the cemetery, including their inscriptions and location. These records, which have been added to over the years, are given below. 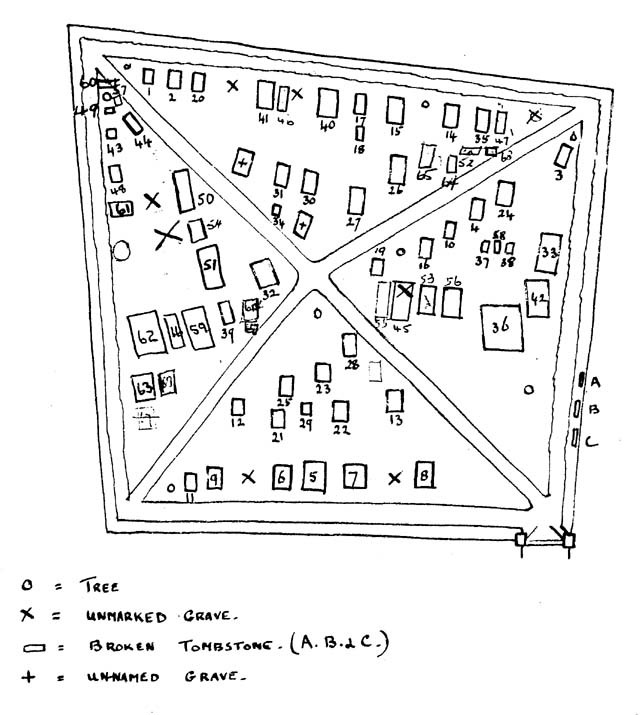 At the bottom of this webpage is an updated version of a plan showing the location of the graves. Incidentally, Dr George MacKay is not buried in the Foreign Cemetery, but lies with a select few in a small private walled graveyard immediately to the east. 1 1870 HUME, George Forrest In memory of George Forrest Hume, Scotsman, Harbourmaster and Tide Surveyor at this port, who departed this life on the 11th of October 1870. 2 1876 DEMETTS, T. H. Sacred to the memory of T. H. Demetts, a native of Canada. Died at Tamsui 12th August 1876. 3 1877 FRASER, Jane Eliza In memory of Jane Eliza, daughter of Jacob Wells, Aurora, Canada, and beloved wife of Rev J B Fraser MD, missionary. Born April 15 1847, died at Tamsui, Formosa, October 4 1877 after a residence of two years and eight months in the island. Blessed are the dead which die in the Lord. 4 1878 JUNOR, Frank Rennelson In memory of Frank Rennelson Junor, only child of the Rev Kenneth Frank and Eliza Jane Junor. Born September 16th 1874, died September 13th 1878. 5 1878 LEFEBVRE, Leopold Consacre a la memoire de Leopold Lefebvre, Douanes Maritimes Chinoise. Ne a Paris le 12 Jouillet 1826, decede a Kelung le 20 Novembre 1878. R.I.P. 6 1879 FRANCISCO, Antonio Sacred to the memory of Antonio Francisco who departed this life June 26th 1879, aged about 56. 7 1882 CLODD, W. L. Sacred to the memory of W. E. Clodd aged 50 years. Died 26th March 1882 at Keelung. A native of Suffolk, England. 8 1884 CURRIE, Neil Sacred to the memory of Neil Currie. Age 23 years. Died 8th Nov 1884 at Tamsui. A native of Glasgow, Scotland. 9 1884 FLORENTINO, Pedro Sacred to the memory of Pedro Florentino, aged 89 years. Died on the 5th October 1884. 10 1887 JAMIESON, George Straith George Straith Jamieson. Born July 28th 1887, died August 27th 1887. Because I live ye shall live also. 11 1888 ANDERSEN, Carl Her hyiler sjomand Carl Andersen. Bodt i Goteborg 1862 afgik ved en voldson dod den 18de Marts 1888 i Tamsui. 12 1888 KORSHOLM, Johann Sacred to the memory of Johann Korsholm, Mate of the SS Wai Ting. Born at Flensburg 8th September 1854, drowned at Tamsui bar 15th October 1888. 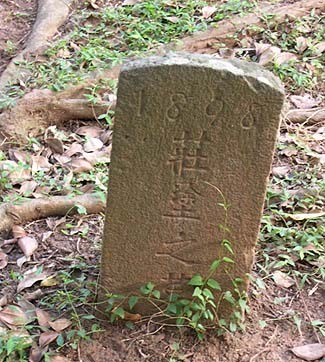 This stone is erected by the Captain and officers of the steamer Fee Chen. 13 1888 SMITH, George In memory of George Smith, late Chief Engineer SS Formosa, a native of Newcastle on Tyne. Died 20th July 1888 aged 34 years. This was erected by his shipmates and friends in token of their esteem. 14 1890 ASHTON, Sophie Charlotte In memory of Sophie Charlotte, the beloved wife of F. Ashton, who died on the 2nd April 1890. Quis separabit. Rom. VIII, 35 to 39. 15 1891 HOLLAND, Florence Anne Sacred to the memory of Florence Anne Holland, dearly loved wife of W. Holland. Born 23 July 1861, died 4 October 1891. Though lost to sight to memory dear. 16 1891 JAMIESON, Rev. John Rev John Jamieson. Died at Tamsui 23rd April 1891. 17 1892 HECHT, Lieut. Max In memoriam Lieut Max Hecht who died in Tamsui on the 19th August 1892 in his 39th year. Ruhe seiner asche. Erected by his friends. 19 1894 PETERSEN, P. W. In memory of P W Petersen who died on the 28th April 1894 aged 49. Erected by his friends. 20 1894 NEPEAN, George Sacred to the memory of George Nepean, C M Customs, who died at Tamsui June 18th 1894. This stone is erected by his friends. 21 1898 dos SANTOS, E. C. Aqui jaz E C dos Santos fallecido aos de Agosto 1898. 22 1903 BROWN, C. D. Sacred to the memory of G D Brown, Apprentice US Navy, age 22 years, who was drowned at Tamsui on March 20th 1903. Erected by the officers and men of the USS Vicksburg. Erected by his shipmates. 23 1905 LOW, Edward Harold Edward Harold Low died June 29th 1905. Loved and mourned by his relatives and friends. 24 1907 JACK, Lilian Jean In loving memory of Lilian Jean Jack. Born Nov 17 1907, died Nov 20 1907. Of such is the kingdom of heaven. 25 1908 BARLOW, John Kennedy In memory of John Kennedy Barlow, eldest son of J. K. Barlow of Betsham, Kent, England, who was accidentally drowned whilst bathing at Twatutia on the 25th September 1908 in his 22nd year. In the midst of life we are in death. 26 1909 GARDINER, Arthur Frederick In loving memory of Arthur Frederick Gardiner, youngest son of Colonel T G Gardiner (late of the Buffs Regt) Aubrey House, Twickenham, who died at Formosa July 24th 1909, aged 44. Until the day break and the shadows flee away. 27 1909 TAYLER, Dr George Padgett In loving memory of my dear husband George Padgett Tayler who died Dec 18th 1909 aged 35 years. Until the day breaks. This stone was erected by the foreign residents of Daitotei as a token of regard. 28 1911 ROSS, Henry Charles In memory of Henry Charles Ross. 20th June 1854. 1st October 1911. Ross. 29 1912 LAMB, L. M. L M Lamb, Chief Officer SS Dacre Castle. Oct 15th 1912. 30 1915 KELL, Fergus Graham In memory of Fergus Graham Kell, aged 42 years, who died at Amoy 18th October 1915. Give to those that ask and from he that would borrow turn thou not away. 31 1918 AMINOFF, Johan In memory of Johan Aminoff. Born in Finland Dec 29th 1850. Died in Taihoku Mar 21st 1918. 32 1919 CLIFTON, Grey Walter Grey Walter Clifton, American citizen, Tea Expert of M.B.K.. Born at Jersey City N.J. U.S.A., April 11th 1875. Died at Taihoku Taiwan Japan, September 9th 1919. Erected by M.B.K. Taipeh. 33 1923 GAULD, Rev. William M.A., D.D. Gauld. In loving memory of William Gauld B.A. D.D.. Born Westminster Canada Feb 25 1861. Died Taihoku Formosa June 13 1923. I am the way the truth and the life. Erected in part by North Formosa ... .
34 1926 KAY, Barbara Barbara Kay. 4th June 1926. 35 1926 QUIRENTINO, Joaquin In memory of Joaquin Quirentino, born at Senchu Fukien China on March 26th 1899, died at ... December 1926. 36 1928 NICHOLLS, Percy Charles Percy Charles Nicholls. Born 20th October 1885. Died 19th July 1928. 37 1928 DICKSON, Arnold Arnold Dickson. 38 1929 DICKSON, Jeanne Jeanne Dickson. 39 1933 GILMORE, Kenneth R.I.P. Edward Kenneth Gilmore. Died December 28th 1933, aged 21 years. 40 1934 NISSEN, George Frederick In loving memory of George Frederick Nissen. Departed this life June 2nd 1934, aged 64 years. May he rest in peace. Amen. 41 1934 HAYLEY, Charles Steiger In loving memory of Charles Steiger Hayley. Born Nov 3rd 1906 at Galle, Ceylon. Died June 18th 1934. With the Lord there is mercy and with Him is plenteous redemption. 42 1938 YATES, Rev. Narcissus Peter Yates. Narcissus Peter Yates, missionary to Formosa. Born Frelichsburg Canada 1862. Died Taihoku Formosa 1938. End of Records of Tamsui Foreign Cemetery as arranged by M Archer, January 1939. The following entries have been made by different parties over the period to 1994. 44 1940 BOYOL, Jose Maria Boyol Jose Maria. "Jose Ma Boyol. Died Sept 13 1941 Taipei." B ? ? , Mary "Sacred to the Memory of Mary"
45 1952 CONWAY EVANS, Adrian "To the glory of God and the beloved memory of Adrian Conway Evans, H.B.M. Vice Consul in Formosa. Born June 14th 1905. Drowned while bathing August 15th 1952 together with his friend Osmond Smyth who gave his own life in trying to save him." 46 1953 MYERS, Patrick Schaefer Patrick Schaefer Myers. Born November 18th 1953. Died November 20th 1953. Buried November 29th 1953. Father: Sgt. Eugene B. Myers (US citizen), 723 Beach Street, Pass Christian, Mississipi. Mother: Margaret Ann Myers. "Patrick Schaffer Myers. Born Nov. 18 1953. Died Nov. 20 1953. The Lord gave and the Lord hath taken away. Blessed be the name of the Lord." 47 1953 HICKOX, Baby "Baby" Hickox. Born 0015 hours December 23rd, 1953. Died 0645 hours December 23rd, 1953. Buried December 26th, 1953. Father: Mr Edward Hickox (US citizen), 400 Lamar Ave, Pittsburgh, Pa. Mother: Roberta L. Hickox. "+ Baby Hickox Dec. 23, 1953." 48 1954 MOORE, Marie Caroline Mary Caroline Moore. Born March 3rd 1954. Died March 4th 1954. Father: Joseph H. Moore (US citizen), Route 5, Box 284B, Alexandria, Virginia, U.S.A.
49 1955 JUNKIN, Jeanette DuBose Junkin, Jeanette DuBose. Born November 28, 1949. Died January 14, 1955. Father: Rev. Wm. Francis Junkin (US citizen). "Jesus is my shepherd. Jeanette DuBose Junkin. Nov. 28, 1949. Jan. 14, 1955." 50 1955 KOCHER, Rose "Gott ist Liebe, Rosa Kocher, Missionarin. 7.7.1894 - 12.11.1955. 2 Tim. 4. 1-8"
51 1955 GUNTHER, Walter "Hier ruht in Gott Walter Gunther. 1.2.1902 - 11.12.1955"
52 1956 WALK, (Baby child) Infant daughter of Capt. J. F. Walk (U.S. Army 057300). "Infant daughter of Captain and Mrs James F. Walk, United States Army. Died Taipei Taiwan May 8, 1956." 53 1956 BARTLEY, (Baby child) "Robin Bartley, May 6 to May 20, 1956, rests here in peace". Son of Ronald G. Bartley, British Vice Consul, Taipei. 54 1956 WOLLUMLLER Dr. Leonard Johann Wollumller. Born: May 21, 1886, Munchen, Germany. Died: Tamsui, June 3rd, 1956. "Gott ist Gerecht, sein ganzes leben war muhe & arbeit. Hier ruht in Gott unser herzl iebster onkel Dr. Hans Wallmueller. Geb. 21 Maerz 1886 in Munchen. Gestb. 3 Juni 1956 in Taiwan". 55 1958 GREEN, Inez Miss Inez Green (Missionary). Died Taipei November 21, 1958. Buried November 23, 1958. 56 1958 CHRISHON, Donald Ray (Baby) Donald Ray Chrishon. November 17 (born Tainan) to November 27, 1958 (died Tainan). Son of Mrs Barbara Ann Chrishon (wife of U.S. Airman). 58 1959 TANK, baby "Baby" Tank. Born 4.55 A.M. September 22, 1959. Died 7.00 A.M. September 22, 1959. Buried September 23, 1959. Father - Vernon William Tank (Missionary) - U.S. Citizen. Mother - Marilyn Ruth Tank. 59 1961 BOLTON, Leonard George Leonard George Bolton. Born: - Died: - . Buried February 22, 1961. 60 1961 MANTE, Audrey Frances Audrey Francis Mante, nee Brown. Born: Winnipeg - December 1, 1924. Died: Taipei - June 4, 1961. Nationality : Canadian. Buried June 6, 1961. 61 1962 STRIBLING, Frances Miss Frances Stribling. Born: Walhalla, S. Carolina. 15.12.1890. Died: January 7, 1962. Nationality: American. Buried: January 9, 1962. 62 1962 TIELEMAN, Miss Henrietta Alta Miss Henrietta Alta Tieleman. Nationality:- American. Born:- September 9, 1896. Died:- February 27, 1962. Buried:- March 2, 1962. 63 1962 JACOB, Erich Mr Erich Jacob. Nationality:- German. Born: March 2, 1910. Died:- March 19, 1962. Buried Sunday, April 8, 1962. 66 1964 ORMISTON, Ida M. Ida M. Ormiston. Nationality: British. Born: - . Died: 1864 (Aged 83 years). 68 1966 HILL, Sara Elizabeth Miss Sara Elizabeth Hill. Nationality: American. Born: February 27, 1966. Died: April 25, 1966. 69 1970 BOGAARS, George Edward George Edward Bogaars. Born Ceylon 18 Jan 1900. Nationality: Citizen of UK & colonies (Singapore certificate N.O.R. 45/6(1)49 dated 1st November 1949. Died 22 February 1970. Entry No 6 of 6 March 1970. Citizen U.K. & Cols.